Student engagement dramatically falls from middle school to high school. 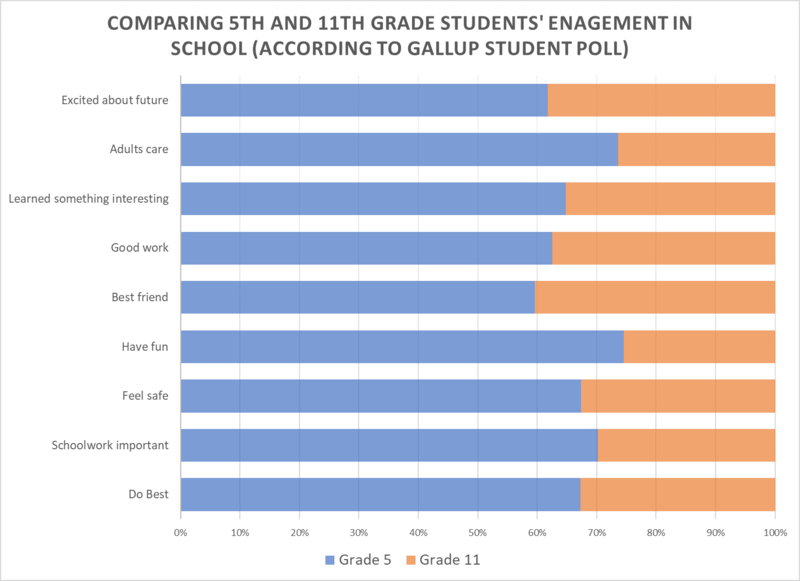 According to a massive survey of US and Canadian students, Gallup found almost ‘three quarters of all surveyed fifth-grade students’ are engaged, while only ‘one-third of surveyed students in 10th, 11th and 12th grades are engaged”. Yes, high schoolers are growing outside of the classroom, participating in sports, making friendships (many of them lifelong), and exploring interests, so school seems unappealing, too structured. But ideally (in my opinion), the percentage of engaged students remains somewhat stable from middle school to high school. A small disclaimer, the high school model might not work for everyone and does not have to. Students who work towards a career outside of school or align themselves with a skilled trade might never get engaged in high school. For example, a programmer/ hacker who does a lot of coding in his or her free time still secures a future career (moreover, the standard high school program still lags what is offered in extracurricular activities related to programming). Another example are students who are working while in high school; hopefully they get the necessary skills for future growth (ideally with the help of a mentor). Why are students becoming so disengaged when learning becomes so critical to their future success, when they must make mature decisions of what skills they need and how to acquire and them? There is considerable growth in resources to identify personal learning and career tracks. One type is a game or VR to simulate actual experiences. Knack is making considerable headway in this area. Another type is to collect data/content from your everyday experiences (big data) and then crunch out the analytics. A teenager using FitBit devices might identify behaviors or tendencies worth developing. Or a teenager might analyze their posts in social media to identify personality traits (FiveLabs). A Growth Mindset. Students are motivated. Most students feel they can learn skills if they put in the necessary time and effort. Personalized. There is required learning. But otherwise, students work on their own evolving skill set. Students learn their own way. Experiential Learning. Learn to practice and apply skills. Students get motivated on actually applying their knowledge. Previous Previous post: Hire Character. Hire Skill. Train Skill.